Play’n Go has been around for over a decade and has garnered a strong following. While the software provider doesn’t limit itself to a casino game category it does specialise in mobile optimised real money games. We take a look at what’s on offer from Play’n Go and the best games to access on your smartphone or tablet. Play’n Go software is a large fish in the online gaming market. Play’n Go has been producing its own high quality, exciting games since 2004 and creating content for other companies since 1997. The provider offers a great variety of games including pokies, table games, bingo, scratchies and video poker. With this sort of range, we know Play’n Go has something to cater for every punters specific taste. 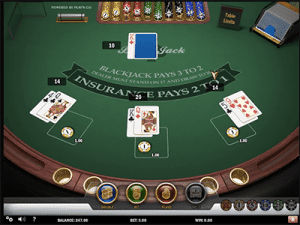 The online casino provider develops their games for both the Flash platform and HTML5 so players can access any releases on their iPhone, iPad, Samsung, Windows, Blackberry, or other portable device. You can generally find Play’n Go games at online casinos which offer a variety of other software providers including Microgaming, NetEnt and BetSoft. However, we recommend secure sites such as the one’s listed above – picked specifically thanks to their range of Play’n Go games. Play’n Go has a range of more than 60 video pokies available for players, and are constantly adding new titles. All of the Play’n Go pokies boast colourful graphics and fun gameplay. We detail two in depth below. This title could be described as more of an arcade game than a pokie. 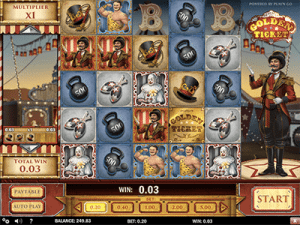 It features a 5×5 grid with a strongman situated next it, thanks to its circus theme. There’s Cascading Reels and a Golden Ticket Bonus round where the screen will transform into a shooting game and you will need to match five or more symbols to receive more bonus rounds – you can score up to 20. You can find Golden Ticket at HouseofJack.com. 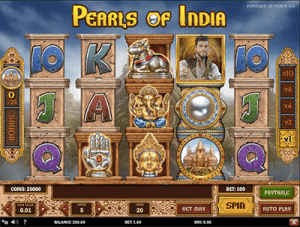 This theme follows Riche Wild looking for pearls in India, with 20 paylines featured across 5 reels. Players are treated to Cascading Reels here too, but the Bonus feature is unique. Every time you score temple symbols it will fill up a metre and once 25 have been accrued you can pick one of three bonus rounds. Wall of Shiva, where players pick tiles to earn prizes. There are a lot more available at our recommended online casinos in the table above. Unfortunately, you may not be able to find all these table titles at the secure sites listed above. But you can find versions of baccarat, roulette, and blackjack from Play’n Go. The following video poker games can be found at our recommended online casinos. Are Play’n Go casino games secure? Play’n Go is governed by the Malta Gaming Authority, The UK Gambling Commission and the Alderney Gambling Control Commission. This means the provider has been tested by not one but three advanced gaming jurisdictions and passed their high criteria. This also means all the pokies, table games, video poker games and more are fair and free of manipulation – these are the standards required by these licensing agencies. For the best range of Play’n Go pokies, we recommend visiting HouseofJack.com and signing up to play with real money.